I love this meal – light, healthy, filling, and best of all delicious! You can substitute tuna if you’re not a fan of swordfish. We usually serve this with rice. Enjoy! Heat 2 teaspoons olive oil in a saute pan over medium heat. Add peppers, onions and garlic and sauté until softened, 2 to 3 minutes. Add tomatoes, fish stock (or water) and wine and bring to a boil. Cook, uncovered, over high heat until thickened, about 10 minutes, stirring frequently. Stir in olives and rosemary and season with salt and pepper. My husband and I took a little long weekend to Florida this past weekend. As we sat sadly in our hotel room getting ready to come back to the freezing/snowiness that is Boston, I looked over and thought our suitcases looked so cute sitting by the door together. I got these luggage tags as a bon voyage gift right before our honeymoon a year and a half ago from a dear friend who is also an exceptional gift giver. Pink for me, blue for him. Not only are the luggage tags super cute, the bright colors help us easily identify our bags at the luggage carousel. And luckily this trip my husband brought a too-big suitcase to help bring home some of my outlet shopping finds! *Sad note – my pink “hers” luggage tag didn’t make it back to Boston with us…I’m hoping a kind soul finds it and drops it in the mail to me. 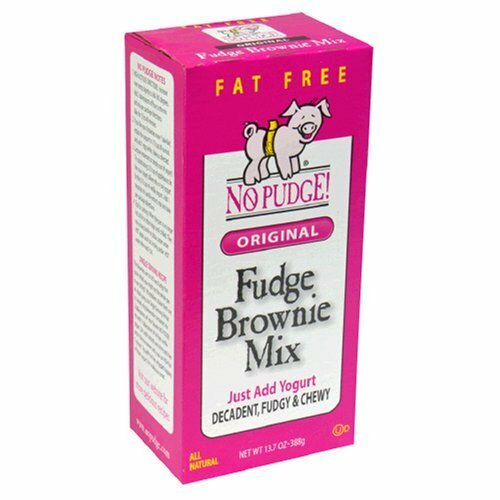 I will tell you right now they are not an equal replacement to a regular full-fat and calorie brownie, but they sure are good. And they couldn’t be easier to make – just combine the mix with non-fat vanilla yogurt and bake. Easy! They also give you the measurements if you want to bake just one brownie to get your fix without baking (and possibly eating) an entire batch. And here are the facts – only 120 calories for one brownie! I have a season’s pass on our DVR scheduled to record the Martha Stewart show every day. I love it. I get so many ideas from her! I love how she’s so casual and sometimes attitudinal on her show, and she is completely obsessed with J. Crew, almost as much as I am. After a weekend away filled with skiing and apres-ski snacking, my husband and I got home Monday night needing a light, quick, and delicious meal. We decided on crab cakes with a little salad. I thought we should make homemade dressing, which always comes out so great I wonder why I don’t do it more! The crab cake recipe we use is PHENOMENAL! The combination of the buttery Ritz Crackers along with the large amount of crab we use makes for a very tasty crab cake. Heat 2 Tbs oil in skillet over high heat. Saute green onions until tender, cool slightly. Then, combine crab meat, sauteed green onions, and next 8 ingredients (through s&p). Form into 1/2 inch thick patties. Coat the patties with bread crumbs. Heat oil in a skillet over medium high heat. Cook cakes until brown on each side. To make the tartar sauce, mix all ingredients together. Serve atop crab cakes. When we moved into our home 2 years ago we knew project #1 would be gutting our upstairs bathroom (it was 100% 1950’s rose pink, we did that a year ago) and project #2 would be gutting our downstairs bathroom (it was 100% green and black, I affectionately called it our mint chocolate chip bathroom). Well – we have just completely finished project #2 so I thought I would share the details. I always like to start a project with something as our aesthetic inspiration. For this project the inspiration was this really great map of Paris, which we had framed to look like a real piece of art. And thus our Parisian bathroom was born. Then came the most difficult task of finding the sink and vanity. This bathroom is a long and skinny 1/2 bath, which made it impossible to find a standard vanity to fit. We went to Peabody Supply Company in Waltham and found the perfect vanity that we could customize to the right size. We love the very dark brown wood and brushed nickel knobs. We picked a light speckled counter/sink to contrast the dark of the vanity. The tile for the floor was the next find. We thought the greens and browns in this tile would coordinate nicely with the rest of the room. Quickly after that we finalized paint colors – green on top and light brown on bottom (we knew from the start we wanted wainscoting on the walls for a rustic feel). Then it all came together! My talented husband actually did all of the gutting, tiling, construction, plumbing, etc… himself, how impressive, don’t you think? I of course added a few finishing decorating touches and then, as they say…il était complet! And here is the before – we had already started construction when this was taken.